Map. Dot. Fingerprint. These words don’t appear to make sense together, but they describe a type of corneal dystrophy, the most common of several degenerative eye conditions that occur when material builds up on the cornea. Another name for map-dot-fingerprint dystrophy -- equally odd -- is epithelial basement membrane dystrophy. By either name, symptoms include blurred vision, intermittent pain in the affected eye, sensitivity to light, streaming tears and the feeling that a clump of eyelashes has gathered in the eye and refuses to come out. The condition most often develops between 40 and 70, literally disrupting any rosy view you may have had about aging. I know this because after map-dot-fingerprint dystrophy lay dormant for almost two decades, it has recurred, and I am typing this without benefit of clear vision in both eyes. When I was first diagnosed some 18 years ago, my vision was blurry for a couple of months. This time, I experienced blurred vision and occasional pain. Early in June, for two weeks, I was awakened repeatedly by a stabbing pain in my left eye and the feeling that my eyelid was stuck shut. It was. I was experiencing corneal erosions. That’s what caused the pain, the swelling, the redness and the eventual breakdown of corneal tissue. The epithelium is the cornea’s outermost layer, the clear dome that serves as the first line of defense in protecting our eyes. During an erosion, errant cells on the outermost layer of the epithelium rise up and can stick to the inside of the eyelid. Tears help nourish the cornea, but everyone’s eyes get dry during sleep. That lack of lubrication, I’ve learned, can contribute to flare-ups of map-dot-fingerprint dystrophy. I was. When the blurriness first began, I dallied, blaming spring allergies. When the corneal erosions began, I started using artificial tears more often during the day and a thick eye ointment at night, treatments recommended when the condition was first diagnosed so long ago. When the erosions increased, I headed to my eye doctor. He said I was doing all the right things; to keep it up. Three weeks later, an exceptionally painful erosion woke me before 6 a.m. on a Sunday. Though I immediately flooded the affected eye with artificial tears and applied an eye ointment I had on hand, the pain and throbbing did not abate for over 90 minutes. I was back in the doctor’s office the next morning. I was told to use preservative-free eye drops to both eyes every hour that I am awake, to use ointment in the affected eye three times a day and to apply ointment to both eyes every night. If I wake up during the night, I am to apply additional ointment or drops as needed. “None of these treatments include medication, so you can use them as often as needed to keep your eyes moist,” the doctor said. The extra moisture could help the cornea heal itself, she said. Because of the corneal breakdown caused by the erosions, the doctor emphasized that I could not slack off. “Be vigilant,” she said. I headed to the pharmacy and bought the eye drops and ointments, all over-the-counter products. An eye exam eight days later revealed that the cornea was healing and that the bumpy surface caused by the map-dot-fingerprint dystrophy was smoothing out. I asked the ophthalmologist what to expect in the future, what to regard as a benchmark of healing and what would indicate a regression. “You could improve, you could stay the same or you could have another corneal breakdown,” she said. “It’s too soon to tell what’s next. You may have vision changes because of this and you may not – we don't know. Keep treating your eyes around the clock and we will continue to monitor you.” On the way home, I stopped at a pharmacy and cleaned out another shelf in the eye care section. I’ve done that several more times since. I did find out why this disease is called map-dot-fingerprint dystrophy. The National Eye Institute (https://nei.nih.gov/health/cornealdisease) notes that the dystrophy occurs when the epithelial basement membrane develops abnormally and forms folds in the tissue. The site also reports that some people who have map-dot-fingerprint dystrophy never experience any symptoms. For the rest of us, if treatment fails, there are options for outpatient surgery. 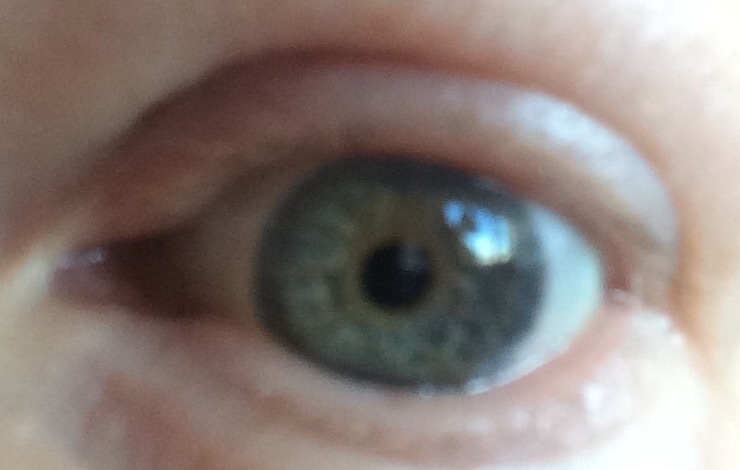 Also, I learned that map-dot-fingerprint dystrophy usually is genetic, as are other eye dystrophies. They include Keratoconus, which affects one in every 2,000 people in the U.S., mostly teens and young adults; Fuchs’ dystrophy, which causes a gradual decline in vision and is most often diagnosed in people in their 50s or 60s; and Lattice dystrophy, a condition that most often begins in childhood. Most of these diseases affect both eyes and most progress gradually. They are not related to other eye diseases or diseases that affect other parts of the body. Some corneal dystrophies cause blindness; others do not. So far, map-dot-fingerprint dystrophy has cost me several trips with Uber and Lyft when my vision was especially blurry, co-pays at the doctor’s office and an unknown sum (I am reluctant to add it up) for the eye drops and ointments. Because I have cut back on screen time, I am not working. I am behind on the news (not a bad thing), FaceBook and on-line Scrabble and Words With Friends. What have I gained? A sense of peace about my slower days and also time to think about what I want the next stage of my life to look like. (Yes, I am counting on stable vision eventually – and I want to get back to writing about wildlife!) In a rare recent moment dedicated to math, I figured out that I have spent 43 years of my life working, 32 of them full time. Maybe that’s enough! I also have an increased appreciation for my eyes and the importance of caring for them and an immense sense of gratitude that I was able to see well enough to write this. Listen up: If your vision becomes blurry or you wake up with dry eyes and stabbing pain, get to an eye doctor right away.